Minerals on and beneath the seabed may represent the next great bounty of the ocean, but retrieving them can be a daunting challenge. Stevie Knights examines two early deep-sea mining projects, including Blue Nodules. 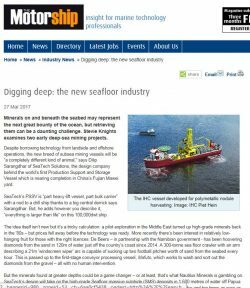 The article called ‘Digging deep: the new seafloor industry’ was published on the 27th of March 2017.